Currently in the U.S., Mendonça is director of Brazil’s Network for Social Justice and Human Rights. She is also a professor in the international relations department at the University of Rio de Janeiro. Her article states: “Historically, Indigenous and peasant communities in Brazil have resisted against violence and displacement. Land concentration is a root cause of social and economic inequality, in a country where 1 percent of large landowners control over 90 percent of agricultural land. 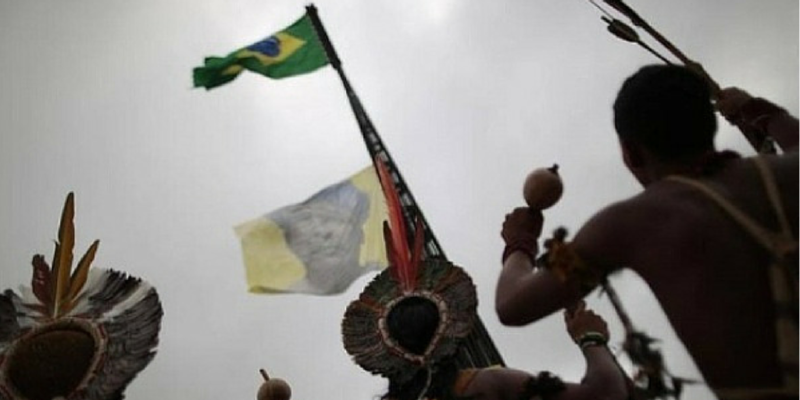 In the past 12 years, 390 Guarani Kaiowa Indigenous people were assassinated in the state of Mato Grosso do Sul, where agribusiness corporations and local large landowners have expanded monocropping of commodities. “The BAMAPITO region, which combines the states of Bahia, Maranhão, Piauí and Tocantins, has also become a target for land speculation and the expansion of agribusiness. This savanna area, rich in biodiversity, has been the home of traditional peasant communities for hundreds of years. Recently, this so-called ‘last agricultural frontier’ is at risk of destruction by a wave of land speculation, deforestation and pollution of water sources. Land market speculation consists of the same logic as the stock market, by the ‘secret’ purchase of ‘cheap’ land and its negotiation at higher prices. “Especially since the global economic crisis that erupted in 2008, financial corporations have created new mechanisms to invest in farmland in the global South. After the collapse of real estate markets in the United States and Europe, pension funds, banks and other financial institutions targeted farmland as a ‘safe’ asset or as a ‘material’ base that could facilitate the flow of international financial capital. “By 2012, over 1,200 land deals by foreign investors were identified, covering 83.2 million hectares, or 1.7 percent of the world’s agricultural lands. This global trend represents a massive transfer of natural resources from rural communities to agribusiness and financial corporations. Pension funds from Europe and the United States have made large investments in farmland in recent years.